I have been intrigued by the idea of fire cider but kept forgetting about it until I was sick. The problem is, all the recipes I’d seen for it required a few weeks’ steeping time. I might try that sometime, but last week when I woke up with a sore throat and congested sinuses this “instant” version definitely did the trick. Even after I’ve felt better anytime I felt sinus-ey grossness coming on I just take a little and it’s gone very quickly. I will say, this stuff is NOT delicious. 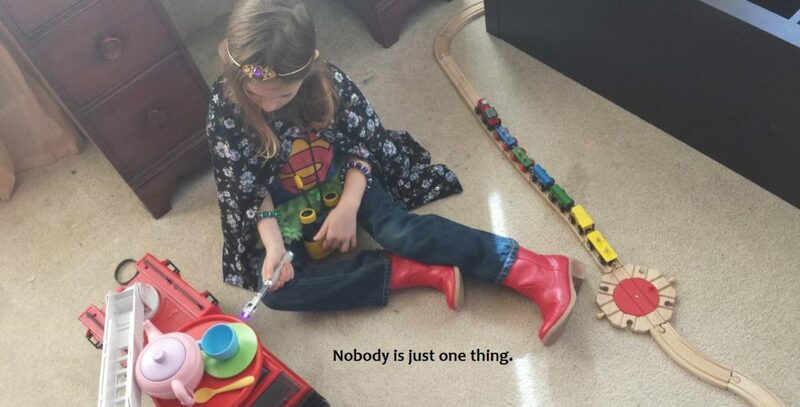 But it is very effective and I had all these things on hand. I did use grated raw ginger instead of powdered. With this year’s especially bad cold and flu season, I know I for one am looking for as many tools as possible to promote health and chase away infections. If you are too feel free to go check it out. S recently came down with what appears to have been adenovirus. It was a fever for a few days, and then he came down with pink eye. In lieu of writing up my own info about it, I’ll just share what mommypotamus had to say about it, because it was helpful and clear. And the honey eye drops worked very, very quickly. I put them in S’s eyes before bed and in the morning he woke up with clear eyes. And they were so simple to make! Just equal parts raw honey and boiled, cooled water (boiling is important for disinfection, cooling is important for not killing off all the helpful raw honey goodness…). This method of treatment was approved by our pediatrician, who I spoke to a couple of times during this illness. We use this to clean almost everything in our home. Vinegar contains about 5% acetic acid, which has antimicrobial properties and will disinfect nearly as well as bleach, but without the environmental and health concerns. If you would like to read more about that, and when bleach is appropriate to use, here’s an article that goes into much greater detail. From a user standpoint, my vinegar spray and a microfiber cloth or old piece of flannel clean windows just as well as windex (not that the windows around here are always or even usually hand-print free; ahem). It can be sprayed thoroughly on a cloth and wrapped around faucets or laid over stuck-on food spots, to be wiped off easily later. If you have some pretty basic supplies, making this cleaner only takes the time necessary to open and close bottles, pour, and shake. I really like when homemade things are easier, cheaper, and better than what you can buy at the store. This is one of those times. Funnel essential oils into the bottle first (that way the vinegar will catch any drops that end up on the funnel by mistake). Use about 20-30 drops, depending on your preferences, the oils you chose, and the size of your bottle. Fill the bottle half-way or more with vinegar, then fill the rest of the way with water. For extra disinfecting power use straight vinegar and don’t add any water. Shake and use. *there are many essential oils that do very well in cleaning applications. Lemon, sweet orange, tea tree, and lavender are popular and easily accessible. Eucalyptus, Thieves blend (or some mix of oils like rosemary, clove, cinnamon, etc. ), peppermint, or other scents that you enjoy will also work nicely. Follow good sense guidelines for using essential oils, and be aware that some oils are not recommended to put on your skin undiluted as they are very concentrated (to make about 10-15 pounds of tea tree EO they start with approximately 1,000 pounds of raw materials; it makes sense to use oils as needed but sparingly for a number of reasons). **the spray bottle pictured there is a fun drinking bottle from an afternoon out, the cap of which turned out to be the same thread size as the top of a bottle of some store bought cleaner I had sitting around from a long time ago. Now I feel fancy when I clean. When I was 8 months pregnant with my son, I once took my 2 year old daughter with me to the liquor agency in my local grocery store. We stood in a very, very long line, receiving more than a few odd glances from our fellow shoppers. When we got to the front I said calmly, “I’d like the biggest, cheapest bottle of undiluted vodka you have in a glass bottle.” Sometimes I think J. must be rubbing off on me because I enjoyed the look on everyone’s faces immensely. Just so you don’t worry, I was buying the (admittedly giant) bottle of vodka to make vanilla, mint, and almond extracts to give away as Christmas gifts. Since then, we’ve also added “hand sanitizer” to the list of things we make with vodka. I mean, if teenagers can drink hand sanitizer to have fun (oh, good grief), why can’t we use vodka to clean our hands? The first recipe I found for homemade hand sanitizer called for equal parts vodka (40% alcohol or “80 proof”) and water. In my state, Ohio, there is also diluted vodka (21% alcohol or “42 proof”) available in the grocery store aisle for wayyyy cheap (like $3 a bottle instead of $10 in some cases), so I just buy that and skip the added water. ***note: hand-washing is the single most effective way to prevent the spread of disease. There. The preschool teacher part of me feels like I’ve done my duty. 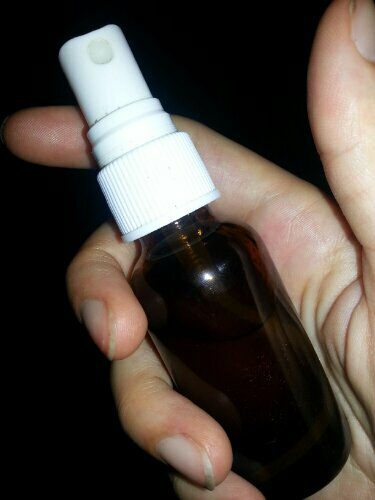 Mix vodka and essential oils in spray bottle. Take with you and shake before each use. Other recipes I’ve seen for homemade laundry detergent are more work-intensive. I’m lazy efficient, so I cut out the extra steps and still end up with a product that works just fine. The liquid castile soap makes this much easier, but if you have bar soap that will be fine too. You just have to grate it up and stir it into a little water on low heat (do NOT boil it–trust me on that one) on the stove until it’s dissolved. For my “economy” or “family sized” detergent bottle (mine says that holds 150 fluid oz. 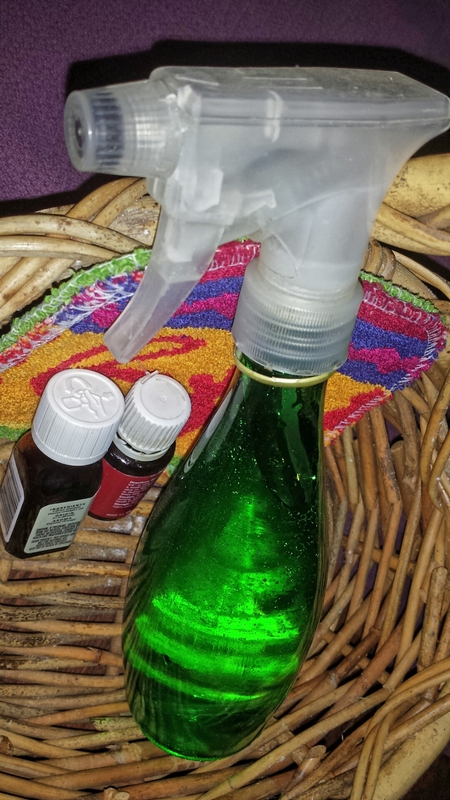 ), I use about a quarter cup liquid castile soap, 1/4 cup borax, and 1/2 cup washing soda. I funnel all these things into the bottle, then add the hottest tap water I can, filling the container up only a little. Cap and shake gently to combine (otherwise BUBBLES), then fill it up the rest of the way. You can let it sit for a few minutes if you like before filling it the rest of the way so some of the bubbles will go down leaving more room for water. Let this set up for a couple of days before you use it, and gently shake it (turn it upside-down a couple of times) whenever you think about it.